archive in the context of the indieweb refers to date-grouped (often monthly) sets of posts (AKA personal historical archives, a common form of navigation), but can sometimes mean archival copy, a copy of a web page made (often by someone other than the author) at a particular point in time. Providing access to archives helps people browse your past content. There are many approaches to providing archive navigation UI. Typically people provide links to specific months and years, sometimes in a list of links, sometimes in a list of years that expend to months, and then only the month links actually navigate you to archives for those months. 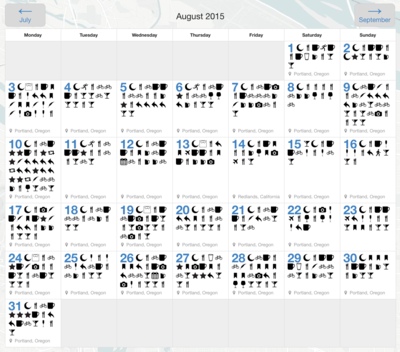 There is also a monthly view which renders a calendar month in a table, and includes icons for each post, as well as a list of all the hashtags and locations from that day. gRegor Morrill has an archive page at http://gregorlove.com/archives/ since 2011-02-14 . It is inspired by Tumblr's archive page. Ben Roberts uses Postly to serve composite archives in either monthly (linked - /YYYY/MM) or daily (unlinked - /YYYY/MM/DD) format since 2014-10-07. 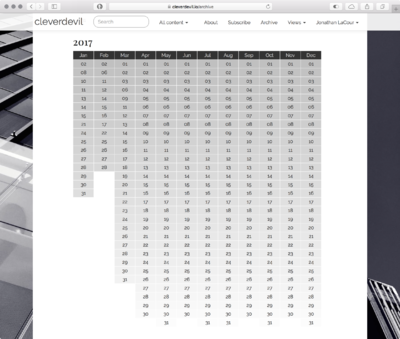 Rachel Andrew publishes an archive view with a few different tiers of visual hierarchy of past blog posts. At the top is a primary article with a background image and post name and subtitle. Next is 6 posts with colored backgrounds instead of photos, and one or two sentences in addition to the post name. 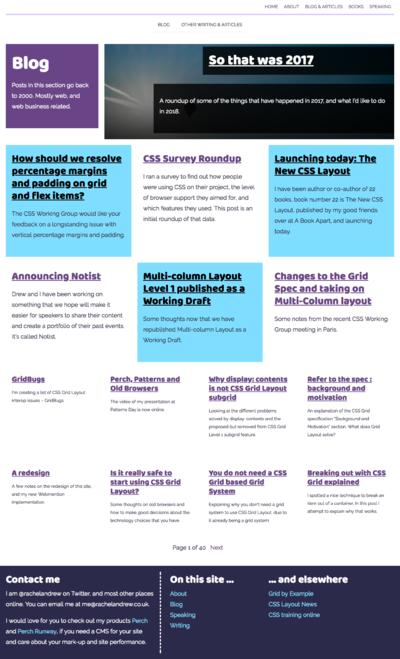 Lastly are 8 more articles visually smaller and with shorter summaries. Eddie Hinkle has several different types of archive pages. 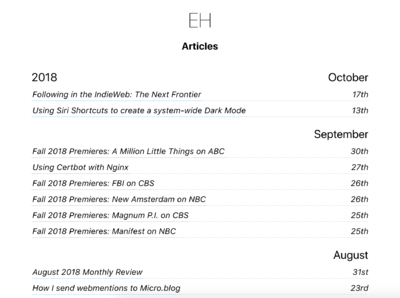 Eddie has an article archive page since 11/02/2018. 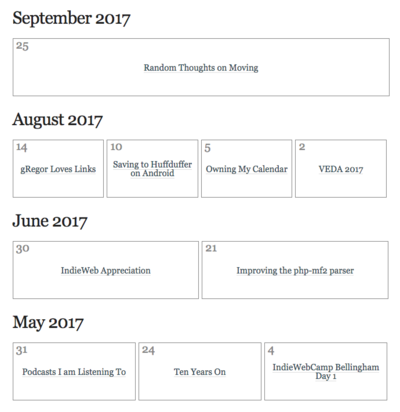 It groups articles by month and year, displaying the article titles and the day they were posted. Eddie has daily archive pages that attempts to group similar information into common categories and display data appropriately for it's purpose. (Watch, Listen and Photo posts just display images that link back to their original post, Ate and Drank posts get gathered together into meals, etc). monthly archive pages are currently just a stream of posts that looks just like a channel or tag page, but it shows posts that happened in that month. I would like to expand this to be more like the daily archive pages. This page was last edited on 18 January 2019, at 00:27.